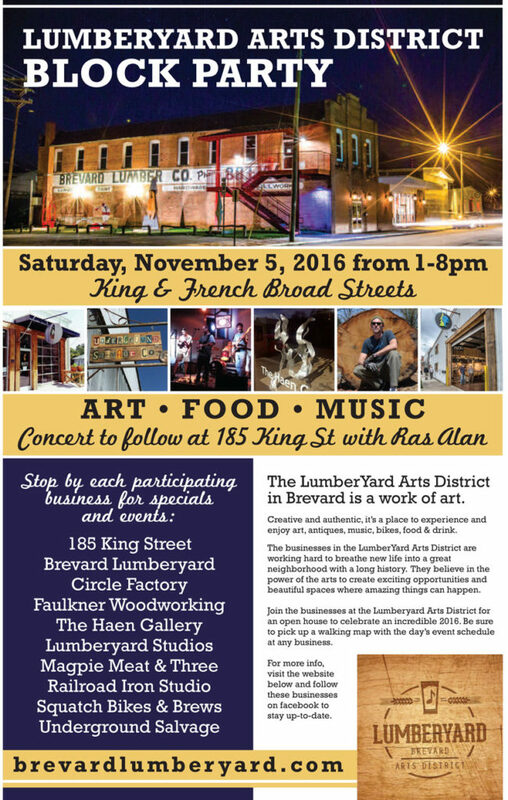 BREVARD, NC (October 10, 2016) – To celebrate an incredible year of growth at the Lumberyard Arts District in Brevard, the businesses in that neighborhood will be throwing a block party from 1:00 to 8:00 p.m. on Saturday, November 5th. The public is invited to come and enjoy an afternoon of art, food, and music. Maps, with a schedule of events, will be available at each business for a walking tour of the neighborhood. Events include art openings, demonstrations, special menus and food trucks, bike demos, music and dance performances, and a live concert to cap off the evening. More details will be announced as the day draws closer. Participating businesses include 185 King Street, with world-class live music in a comfortable and welcoming venue; Brevard Lumberyard, a multi-purpose performing arts center; Circle Factory, the studio of artist George Peterson; Faulkner Woodworking, timber frame construction and fine woodworking; The Haen Gallery, with 14,000 square feet of stunning paintings, photography, and sculpture by local, national, and international artists; Lumberyard Studios, with artists Jenni Barton, Bradford Carson, Cathy Goden, Tiffany Teso-Fisher, and Jessica Carson; Magpie Meat & Three, classic Southern flavors and time-tested dishes in an inviting, comfortable atmosphere; Railroad Iron Studio, with the work of artist Jacob Liske; Squatch Bikes & Brews, a full-service, state of the art bike shop; and Underground Salvage, with amazing finds, salvaged materials, antiques, and unique furniture. The businesses in the Lumberyard Arts District are working hard to breathe new life into a great neighborhood with a long history. They believe in the power of the arts to create exciting opportunities and beautiful spaces where amazing things can happen. They invite you to join in this celebratory day. The historic Lumberyard Arts District is located between King and French Broad Streets in Brevard. For more information, visit brevardlumberyard.com and follow these businesses on facebook to stay up-to-date. This entry was posted in Past Events on October 10, 2016 by oliver.